In our quest to add smartness to new things (see what we did there? ), we’ve been busy growing and evolving the Works With SmartThings (WWST) program. Today, we’re excited to share more details around two awesome integrations: Netgear Arlo and Google Home. By integrating Netgear Arlo and Google Home with SmartThings, you’ll not only be able to access live video streaming, but you can also talk to your smart home and control it with your voice. What a time to be alive! Voice. Why does this matter to you? Google Home brings to the table a lot of its powerful machine learning and artificial intelligence–which means you can interact with your smart home a lot more naturally. Just as you might not want to walk over to a light switch or tap your thermostat to adjust it, you might not also want to whip out your smartphone every time you control your smart home. 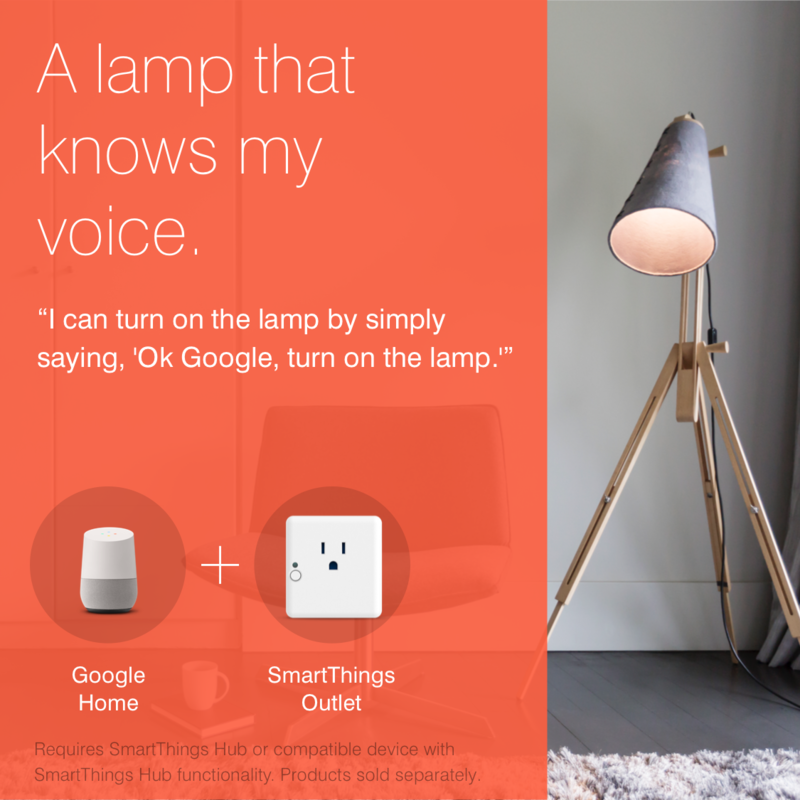 By combining SmartThings + Google Home, you don’t have to. Our Google Home integration essentially turns your home into an on-demand butler that’s ready to respond to your every beck and call. All you need to do is to tell your lights and thermostat what it is you want them to do and they will spring into action. How does this work? Why do I need it? By pairing Google Home + SmartThings, you can tell your lights to turn on or off, change their colors, or adjust your thermostat. Already in bed and forgot to turn down the thermostat? Sitting comfortably on the couch and don’t want to dim the lights when watching a movie? Just say, “Okay Google, turn up the thermostat” or “Okay Google, dim the lights.” Easy peasy. Video: What’s the big deal? The big deal is live video! Trigger-based recording! Adding Arlo to the platform and WWST program was a no-brainer, and we’re the only DIY smart home platform to have these capabilities. What does this mean? Based on rules that you set (ex: unexpected motion, unwanted entry, etc. ), SmartThings will send you an immediate notification and our Netgear Arlo integration will begin live-streaming a video of the event that’s taking place that you can access on your smartphone. Whether it’s a teenager sneaking home after curfew, a dog on the couch, or keeping an eye on Amazon Prime deliveries, we’ve got you covered. 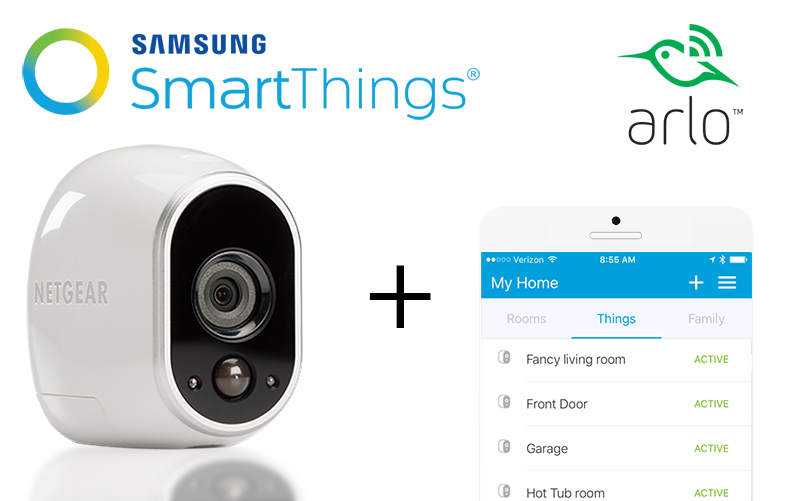 The addition of Netgear Arlo and Google Home to the SmartThings platform takes the smart home to a whole new level. The smart home is getting much simpler to use, and we’re proud to be a part of that movement with Google Home and Arlo through voice control and video.